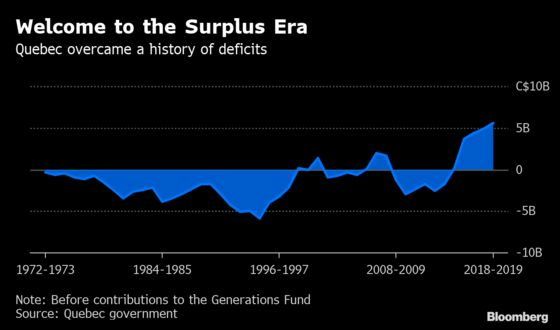 (Bloomberg) -- For tips on how to end a streak of budget deficits, Ontario needs to look no further than its eastern neighbor. Quebec, which recorded shortfalls for 34 of 40 years through 2014, has now turned into Canada’s “fiscal boy scout,” according to National Bank Financial economist Warren Lovely. That hard-won status was burnished by Premier Francois Legault’s first budget last month, which stuck to that discipline with a balanced budget. By contrast, Ontario is expected to post its 11th-straight deficit when it releases its fiscal plan in Toronto Thursday. Spending restraint and a strengthening economy have helped Quebec post five straight surpluses, reducing the second-highest debt burden in the country and allowing the province to set aside hefty reserves to weather a downturn. Borrowing costs in the mostly French-speaking province now trade below Ontario’s, which is poised to lay out a path to balance in Premier Doug Ford’s first budget since winning power last June. Quebec’s improvement came at a cost. While most parties pledged to restore fiscal health during the 2014 provincial elections, the Liberals had to contend with lower-than-expected growth and tax receipts when they returned to power after a 19-month stint by a separatist party. Leitao, a former economist, announced a hiring freeze, tax increases on tobacco and alcohol and spending cuts in his first budget that year, before spending parts of the summer on the road to explain his plans to investors and ratings companies. His 2015 budget slammed the brakes on spending for departments including education and health, helping generate a surplus but earning the government a reputation of austerity that came back to haunt it during last year’s election. The task became easier as economic growth reached the fastest pace in 15 years, boosting revenue and letting the government cut taxes in the second half of its mandate. Still, the Liberals lost power in October and Legault inherited the biggest surplus since at least the 1970s. Quebec also benefits of course from so-called equalization payments from the federal government to some provinces based on their ability to raise revenue. Quebec will receive about C$13 billion this year, while Ontario will get nothing, according to estimates from the federal finance department. Quebec was among the first provinces that got back to balanced budgets after the global financial crisis, said Michael Yake, a senior analyst at Moody’s Investors Service. While it’s left the credit rating for Quebec unchanged at Aa2 since 2006, Moody’s cut its rating for Ontario twice over the past decade, with the most recent downgrade to Aa3 in December, one level below Quebec. Investors demand four extra basis points to hold Ontario’s bonds maturing in 10 years, compared with comparable Quebec debt. The risk premium increased from zero in March 2018. Quebec’s fiscal turnaround may appear recent, but the seeds were planted in the 1990s and 2000s by adopting legislation to get a grip on its ballooning debt burden. That’s after governments, which initially got into debt to build schools, roads and bridges for the booming population in the 1960s, slipped into chronic deficits to pay for regular expenditures, said Luc Godbout, the research chair in taxation and public finance research at Universite de Sherbrooke. In 1996, under pressure after credit downgrades, Premier Lucien Bouchard pushed a law requiring governments to balance its books as soon as 1999-2000, with some success until the 2008 crisis. In 2006, it created a fund dedicated to repaying its debt, known as the Generations Fund, securing resources by tying it to specific revenue such as royalties from Hydro-Quebec and a tax on alcohol. The fund had a balance of C$12.8 billion ($9.6 billion) at the beginning of the last fiscal year, before C$8 billion was used to pay debt. “Even though it took several years to get to a material meaningful level, today it’s clear that the province is benefiting from the Generations Fund,” Moody’s Yake said. Quebec’s debt relative to the size of its economy is still second only to Newfoundland among Canadian provinces, but it’s declining. The government forecasts that gross debt as a share of the economy will fall below 45 percent by 2020-21, five years earlier than initially targeted. 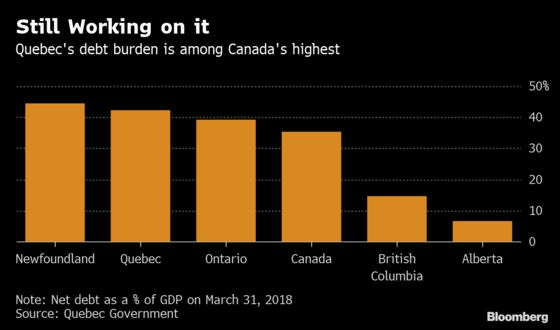 As Ontario’s debt burden increases under the weight of deficits, Quebec has its eyes riveted on the data to measure its progress. On a net basis, Quebec’s debt is 42 percent of GDP, compared with 39 percent for Ontario, according to Quebec’s budget documents.